Birthday cupcakes are fun at a birthday party! Kids love having their very own party cake, and there are times when serving cupcakes is easier than serving a birthday cake. Here are some cute photos for inspiration! 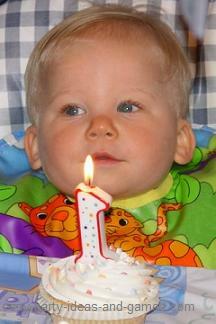 Give the birthday child their very own party cake for their first birthday. A cupcake is the perfect size! Have you seen darling cupcake wrappers? They come in several different designs (and colors!) including the popular princess wrappers and train wrappers. Talk about an easy way to make a birthday treat very festive! This is it! 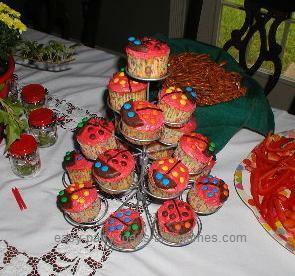 These cute ladybug cupcakes are perfect for a Lady Bug Party or just to celebrate spring! For instructions on how to make, visit our Ladybug Cake page. 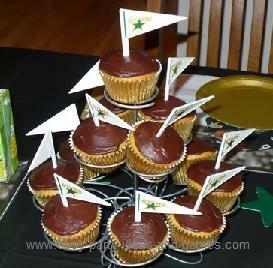 Share your favorite team with your friends by using this cute sports themed idea! Check out our Hockey Cake Page for ideas on a matching hockey cake. 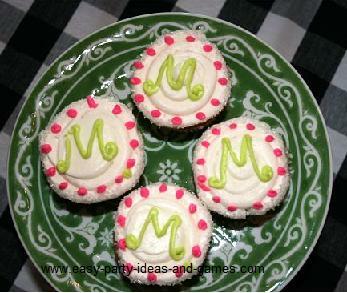 How about doing a "monogram" such as a cupcake with your inital on it?